AddressThe address for this sale in Rancho Cucamonga, CA 91730 will no longer be shown since it has already ended. Since all sales are final, please inspect all items before purchasing. No items will be sold without a price tag. 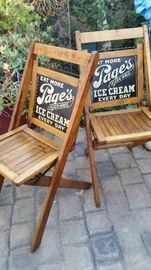 Awesome Antique Advertising Piece; Tin Double Sided Advertising Sign, Folding Wooden Chairs, Page's Ice Cream. 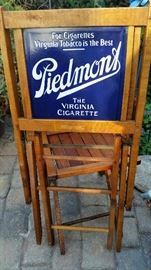 Awesome Antique Advertising Piece, PIEDMONT Porcelian Double Sided Advertising Sign, Wooden Folding Chairs. 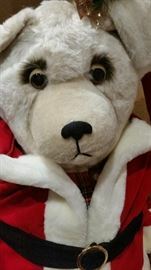 Awesome Custom Made 3' HOLIDAY BEAR, Sporting a red velvet with faux fur jacket and matching hat, plaid shirt, grey tights, matching plaid slippers. He's electric, head goes up & down, arm goes up & down showing off his mask. Pocket watch hanging on opposite side. He's a perfect addition to your holiday decor, beautifully made. 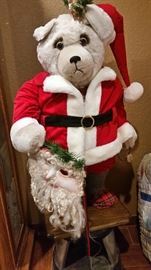 Holiday bear is in excellent condition, holding his mask, arm goes up & down. 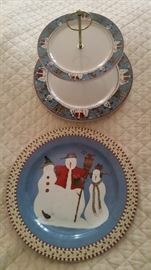 DEBBIE MUMM, Sakura, Snowman Pattern, Retired. 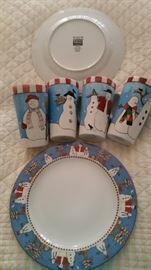 DEBBIE MUMM, Sakura Christmas Dishes, Snowman Pattern, retired. 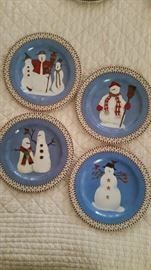 CURRIER & IVES by ROYAL, USA. 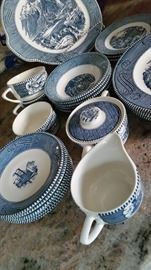 This is a 31 piece lot from the 1960's. 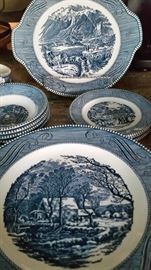 CURRIER & IVES by ROYAL, USA. 31 pieces to this lot. 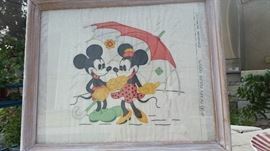 1931, MICKEY MOUSE, Colored, Embroidered Pillowcase by Vogart Needlecraft, Mickey Mouse Series #98, Introduced in 1932. Vogart made this line of fabric patterns for Disney Fabric: aprons, laundry bags, pillowcases, etc. This is a nice piece, mounted under glass. Antique Storage Trunk, Dark Brown Wood - Black Metal, Latches Tightly, "no key" Interior has Wallpaper, trunk is in nice condition. Measures: 32" wide 19" deep 22" tall. Perfect for storage, I've been using it for storage of Christmas pillows, quilts & linens for years! BOYE Brand Needles, Shuttles, & Bobbins, Tin Rotating Country Store Display Cabinent, Patented 1907. Rare, COCA COCA, Stainless Steel, Ice Chest, Removable Sandwich Tray, Drainage Plug, Bottle Opener, Awesome Piece from the 1950's. Measures: 16" tall, 17" wide, 12" deep. Scoopy Gum Vending Machine, Scoopy Manufacturing Co., Produced from 1949 to 1955. Animated Vending Machine, Penny Machine, Scoppy opens the door, gum drops into scoop then drops. Walt Disney, Mickey's Carousel, Revolving Merry-Go-Round Music Box, Mickey, Minnie, Donald, Goofy. Plays : Oh Suzanna , 1990. Nilus LeClerc Vintage Tabletop Loom, Made in Canada. 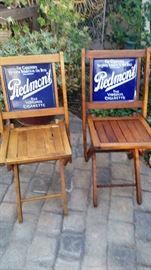 Measures Approximately 20" wide, 20" deep, 17 3/8 tall. Awesome collection you just don't see anymore. I ordered this collection myself from the Franklin Mint in 1988. They were issued one at a time for $37.50 each plus tax . JAYMAR Children's Toy Piano, 25 key, 19 1/2" tall, 16 1/2" wide, Jaymar Specialty Co. Antique Switchboard, Bell System by Western Electric, Awesome Piece! Two Tier, Metal Rolling Library Book Cart or Industrial Cart, Handles on either side, Large smooth rolling wheels, 36" tall, 29"wide, 16" deep. Iron Horse Book Cart by Gaylord. Salesman Sample/Catalog Display, OLD BUTTONS, Mounted on heavy cardboard measuring 12x15. Each card has different types, plastic, metal, velvet, one pkg has small belt buckles. ELNA - Supermatic Sewing Machine, Instruction Book Dated 1954. Machine is in very nice vintage condition, very clean. Carrying case converts into a working table, standard accessories, Elna discs for decorative stitching. Elna sewing machine is known for their excellent quality, household sewing machine with advantages of many special industrial sewing machines. Awesome Collection, Hundreds of Wooden Souvenir Clogs, lot's of sizes & colors, keychain, magnets, ships, lint brush, ten years of collecting! 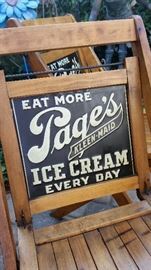 FRIGIDARE by GM, Awesome Vintage Refrigerator, Hand Painted Artwork, Farmhouse Ready! Perfect for Holding Cookbooks, Mixing Bowls, Kitchen Items, (I store cookbooks in it!) Measures approximately: 42" tall, 22" wide, 19 1/2" deep. A Unique Piece! Vintage Doll Trunk, White Plastic Handle, One Drawer, Measures Approximately 19" tall, 10 3/4" deep, open flat 31" wide. Vintage Tin Toy Train, OVERLAND EXPRESS, Battery Operated, Original Box. Complete Fish Tank, 125 Gallon, including fish! This is an awesome vintage custom piece; Original Coca Cola Cooler with a custom popcorn machine on top, made of glass, wood and stainless steel, (picture does not show) Topped with a white metal frame to hold an awesome red & white stripe canvas awning, it's a must see!